Publish your own secure website directly from your PC and remotely access your files. 1AV Share 1.7.8 was available as a giveaway on July 18, 2015! Publish your own secure website directly from your PC and remotely access your images, documents, videos and music, or securely share them with your friends, family, and co-workers. Wide range of extensions and configurable user accounts. How would you improve 1AV Share 1.7.8? 1AVCenter is a powerful Windows application that does the work of an entire library of audio and video applications. 1AVCenter is an all-in-one software for screen capture, video capture, audio capture, webcam capture, computer monitoring, home security monitoring, desktop screen live broadcast, webcam broadcast, streaming video capture, webcam Internet publishing and secure file sharing. Get 1AVCenter with a 90% discount! ScreenCamera.Net is a video recorder, video streaming server, and a virtual camera. ScreenCamera.Net supports all monitors, video devices such as TV cards and webcams, images, movie files, audio files, and text and date-time stamps. Stream and record video formatted to your exact needs. No program on the Internet is capable of generating customized video content like ScreenCamera.Net does. Get ScreenCamera.Net with a 90% discount! Papin - I used the extreme example of personal financial information to get people to think. Don't display public idioticy in thinking I believe people are putting their bank statements in clear public view! The point is that whatever an individual puts "on the cloud" is entrusted to unknown individuals of unknown moral fiber. If you elect to trust your important information, whatever it is, to unknown individuals, that is your right, but don't be surprised when problems arise. If on the other hand believe you're only putting data out there that can not be used to harm you, good luck and for your sake I hope you're lucky. When it leaves your sole possession you loose control forever. And yes, I do fully understand "the cloud" and how ignorant people who don't understand the nature of the net are putting enough information about themselves "on the cloud" the make cyberfraud a very real problem. From your demonstration here I can safely bet a kidney that you will one day be the victim of "the cloud" . Papin - I used the extreme example of personal financial information to get people to think. Don't display public idioticy in thinking I believe people are putting their bank statements in clear public view! The point is that whatever an individual puts "on the cloud" is entrusted to unknown individuals of unknown moral fiber. If you elect to trust your important information, whatever it is, to unknown individuals, that is your right, but don't be surprised when problems arise. If on the other hand believe you're only putting data out there that can not be used to harm you, good luck and for your sake I hope you're lucky. When it leaves your sole possession you loose control forever. And yes, I do fully understand "the cloud" and how ignorant people who don't understand the nature of the net are putting enough information about themselves "on the cloud" the make cyberfraud a very real problem. From your demonstration here I can safely bet a kidney that you will one day be the victim of "the cloud" . Just because you CAN doesn't mean you SHOULD. the program will not install. come on guys, try testing before you post an opportunity like this. It says it can't connect to its own server but, even if you shut off AV and firewall (risky but tried), nothing. does strictly personal use mean that you can't publish a personal business web site? Lots of security issues here, nothing is encrypted as per the results I got. I just wonder, who holds the 128 bit encryption key and who has the master access to it, it certainly is not the user. Uninstalled. The installer demands to get a date code from pcwinsoft server prior to launching their installer , i guess they do not trust the GAOTD wrapper to keep installs on the agreed date? Firewall has to be disabled to proceed! NO sign of how to add signed certificate needed to create a secure webserver... I think the developers think that if .htaccess authentication is required then the server is a "secure" website... That simply is not true! It is not encrypted and all data shared is open to scrutiny by anyone en-route with a packet sniffer. This product is not what it claims and DO NOT EVER USE IT TO SHARE PRIVATE INFORMATION! Also this server is not UPNP aware and is unable as is to serve files or data over the internet from behind a NAT router without manually forwarding ports, this is crazy it can't find out and offer the public IP using UPNP ... which is probably just as well seeing as the webserver is not a secure server (SSL) but a plain old http 1.1 unencrypted server with some automation in generating fancy index pages. The installer demands to get a date code from pcwinsoft server prior to launching their installer , i guess they do not trust the GAOTD wrapper to keep installs on the agreed date? 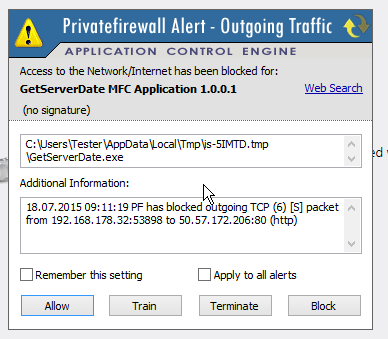 Firewall has to be disabled to proceed! NO sign of how to add signed certificate needed to create a secure webserver... I think the developers think that if .htaccess authentication is required then the server is a "secure" website... That simply is not true! It is not encrypted and all data shared is open to scrutiny by anyone en-route with a packet sniffer. This product is not what it claims and DO NOT EVER USE IT TO SHARE PRIVATE INFORMATION! Also this server is not UPNP aware and is unable as is to serve files or data over the internet from behind a NAT router without manually forwarding ports, this is crazy it can't find out and offer the public IP using UPNP ... which is probably just as well seeing as the webserver is not a secure server (SSL) but a plain old http 1.1 unencrypted server with some automation in generating fancy index pages. 1. This is not an Apache server. There is no .htaccess and .htpassword files here. 2. I had to stop PrivateFirewall. Then, the Windows firewall took over, but the software installed anyway. So, it depends on how permissive is your firewall. 1. This is not an Apache server. There is no .htaccess and .htpassword files here. 2. I had to stop PrivateFirewall. Then, the Windows firewall took over, but the software installed anyway. So, it depends on how permissive is your firewall. 1 Apache is not the only web server that uses .htaccess or .htpassword most comprehensive open source webservers use them, this emulates the functionality, rather than using scripts or forms. 2 I just had to set private firewall to "Allow traffic" rather than "Filter Traffic" to allow it to talk to their webserver during the installation, that is because the hard coded http request to thier server was not strictly http 1.1 compliant in that it sent GET followed by the Full URL including the http://www.pcwinsoft.com/... It is highly probable that private firewall saw the illegal request and dropped it because it was wrong or tried to correct it and instead created something even worse! 1 Apache is not the only web server that uses .htaccess or .htpassword most comprehensive open source webservers use them, this emulates the functionality, rather than using scripts or forms. 2 I just had to set private firewall to "Allow traffic" rather than "Filter Traffic" to allow it to talk to their webserver during the installation, that is because the hard coded http request to thier server was not strictly http 1.1 compliant in that it sent GET followed by the Full URL including the http://www.pcwinsoft.com/... It is highly probable that private firewall saw the illegal request and dropped it because it was wrong or tried to correct it and instead created something even worse! Can not support non-english filenames!It's too bad. Uninstalled! Can not support non-english filenames!It's too bad. Obsolete? You've got to be kidding me! Putting your sensitive, private data in the hands on strangers - and that is exactly what you are doing with cloud storage - is beyond assinine, its dangerous. If a stranger comes to your house and says, "Give me all your banking materials (checkbooks, statements, etc.) and I'll keep them in a safe place that even you won't know about, and for added security, I won't even give you my name, but you can call me anytime, day or night, at the phone number on this business card I printed on my inkjet printer" would you do it??? If you answer "Yes!" then I have some Oceanside property for you in wonderful Wyoming. Anyone who puts ANYTHING of any importance on a "cloud" deserves what they get. Amazing that people these days aren't smart/savvy enough to realize that just because you can do something doesn't mean you should. Obsolete? You've got to be kidding me! Putting your sensitive, private data in the hands on strangers - and that is exactly what you are doing with cloud storage - is beyond assinine, its dangerous. If a stranger comes to your house and says, "Give me all your banking materials (checkbooks, statements, etc.) and I'll keep them in a safe place that even you won't know about, and for added security, I won't even give you my name, but you can call me anytime, day or night, at the phone number on this business card I printed on my inkjet printer" would you do it??? If you answer "Yes!" then I have some Oceanside property for you in wonderful Wyoming. Anyone who puts ANYTHING of any importance on a "cloud" deserves what they get. Amazing that people these days aren't smart/savvy enough to realize that just because you can do something doesn't mean you should. Oops... My comment above was in response to #4. I just want to the BarracudeDrive site and could not find pricing. Is this product $FR.EE? Barracuda drive looks as if it is only compatible up to windows 7 - has anyone used it on Windows 8 successfully? Frankly, do you really believe people are putting their bank statements, chest x-ray, lease agreement, medical ordinances, credicardnumbers.txt file, and whatnot, in public ? Come on. You should have read more carefully before hopping on your horse and galloped right away. I never said: hey, "put[ting] your sensitive, private data in the hands on strangers – and that is exactly what you are doing with cloud storage". You've got it all wrong: (i) you invent words and make me their author, and (ii) you don't seem to know what "cloud" means. @Drken Frankly, do you really believe people are putting their bank statements, chest x-ray, lease agreement, medical ordinances, credicardnumbers.txt file, and whatnot, in public ? Come on. You should have read more carefully before hopping on your horse and galloped right away. I never said: hey, "<em>put[ting] your sensitive, private data in the hands on strangers – and that is exactly what you are doing with cloud storage</em>". You've got it all wrong: (i) you invent words and make me their author, and (ii) you don't seem to know what "cloud" means. "We offer two types of BarracudaDrive licenses -- one for non-commercial (including educational) use and one for commercial use. BarracudaDrive is free to use for non-commercial or educational use. BarracudaDrive does not include any license enforcement management, but you are required to purchase the product if you use it for commercial use." Prima facie, this seems like a better alternative than today's GAOTD offer. Thanks GI Joe -- can you perhaps give more first-hand information regarding security (digital certificates etc) / Windows 8 + etc ? @ Drken : Yes, for non-commercial use it seems to be always free You will find it under the menu system : Download / Purchase Information : "We offer two types of BarracudaDrive licenses -- one for non-commercial (including educational) use and one for commercial use. BarracudaDrive is free to use for non-commercial or educational use. BarracudaDrive does not include any license enforcement management, but you are required to purchase the product if you use it for commercial use." Prima facie, this seems like a better alternative than today's GAOTD offer. Thanks GI Joe -- can you perhaps give more first-hand information regarding security (digital certificates etc) / Windows 8 + etc ? Remote Desktop Access (gotomypc form), email app, blog, etc.. Very sweet freebie. They run it on a 5 watt tiny device I assume is 24/7 as a mini site. I guess one could use your own PC in a hybrid personal-commercial manner. So if some site asks if you want to post your site that has your designed jewelry, crafts, garage stuff it would be decent. Thanks for the post. gbswales - yes to Windows 8.1 x64 Pro. Though doc seems to say IE will work for uploading to a Photo Album drop &amp; drag, I couldn't get it to go. Barracuda finally popped up ad for Chromebook &amp; Chrome. So I logged out of my IE created session, back in under Chrome &amp; bingo can drag a whole mess of photos to the cardboard box - fast. Barr uses 600x800 jpg size &amp; also makes a thumbnail for display. I just jacked around a bit but for general purposes it has lot of features like a Torrent type app, a form of Remote Desktop Access (gotomypc form), email app, blog, etc.. Very sweet freebie. They run it on a 5 watt tiny device I assume is 24/7 as a mini site. I guess one could use your own PC in a hybrid personal-commercial manner. So if some site asks if you want to post your site that has your designed jewelry, crafts, garage stuff it would be decent. Thanks for the post. None of those videos for 1AVShare are using 128bit SSL they all use URL's beginging with http not https, which means they are NOT encrypted but are a simple webserver with maybe digest authentication but NO encryption on the files or data served! 1. Given its purpose, cloud storage and P2P have made this kind of products for home users obsolete. 2. If you insist on having a public web server on your PC. The extremely minimalistic descriptions here and on the web site, including the amateurish design, do not entice anybody to throw away 50 bucks for a product that even hasn't a tool to upload files. Running a public web server on a Windows machine is foolish. Unless you have the required skills to put up a secure access to your PC. But the OS itself is NOT secure. Another example of wasted time and resources, where competition ---free and commercial--- is on a much higher level. 1. Given its purpose, cloud storage and P2P have made this kind of products for home users obsolete. 2. If you insist on having a public web server on your PC. The extremely minimalistic descriptions here and on the web site, including the amateurish design, do not entice anybody to throw away 50 bucks for a product that even hasn't a tool to upload files. Running a public web server on a Windows machine is foolish. Unless you have the required skills to put up a secure access to your PC. But the OS itself is NOT secure. Another example of wasted time and resources, where competition ---free and commercial--- is on a much higher level. There's a word for people who use words like "cloud storage." It starts with m and ends with n and has two o's in it. The same word applies to those who extol the security of this storage. Though the narrator has a thick accent. If you're confused, like I am, about what exactly this software does go to the videos on the website: <a href="http://www.pcwinsoft.com/1AVCenter/video.asp" rel="nofollow">1AVCenter videos</a> Though the narrator has a thick accent. didn't you mean 1AVShare Videos ? didn't you mean <a>1AVShare Videos</a> ? WOW. For the 1st time in my life, i am hearing a software providing encryption for publishing pages but i am curious.. Does it support SEO? I mean will it provide on-page optimization naturally? WOW. For the 1st time in my life, i am hearing a software providing encryption for publishing pages but i am curious.. Does it support SEO? I mean will it provide on-page optimization naturally? NOT installed and registered on a Win 8.1.3 Pro 64 bit system. I am sure, that you are well informed about all related security questions by installing this web server.